It’s summer vacation guys! I'm ready for sun, sand, unlimited ice pops, and best of all, sundresses! And, the perfect addition to a summer dress is a stylish sun hat. Unfortunately for me though, I have a super small head and they always end up flying off! I got tired of holding them down and/or chasing them around, so I wanted to create a solution that would keep my hat where it belongs- on my head! 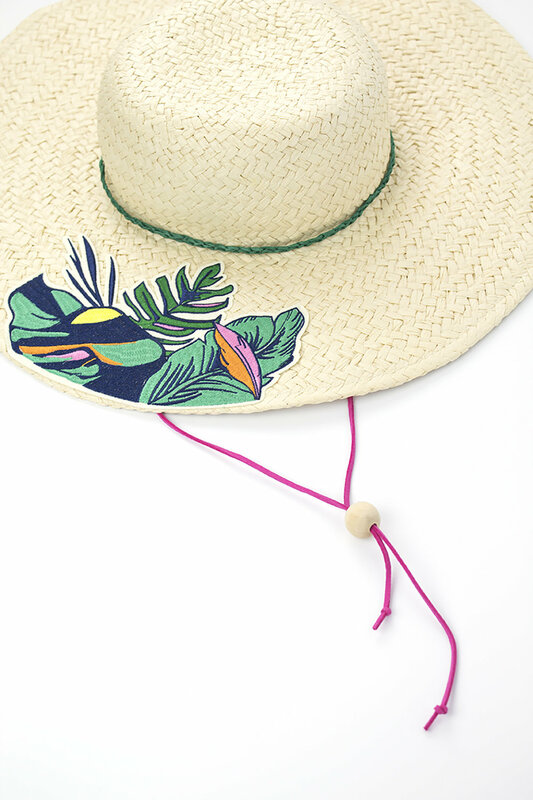 Here's the super easy, genius DIY so your hat can stay on all day long- a stampede string! PS- I wore the string behind my ears/hair, this way I didn't look like a total dork with a string below my chin! You couldn't even see it. While wearing your hat, find the point near your ears and mark on the inside where the strings should go. Take your suede cord and make a hole for your pin near the top, leaving a little extra on the end so it doesn’t break off. I found that it was a bit hard to use the pin to make the hole, so I suggest using a safety pin or thick needle. String a wooden bead through both pieces of suede and tie a knot on each string so it doesn’t slide off. Using your felt, use a small piece to cover both sides of the pin. If felt is too thick, you can use some regular fabric with fraycheck on the ends. Repeat for both sides. Note: This step is optional, but I realized on the trip that my hair would get caught in the pin and it would hurt when it pulled. Although this isn’t 100% foolproof (especially if it’s super windy!) this strap will help you to keep your hat on if a big gust of wind comes your way. I know that without it, I definitely would have had to wave my hat goodbye as it flew down the street. It was already flying off in the Target parking lot after I purchased it! I left my bead natural wood, but you could totally paint it to match the string, the hat, or to add an extra pop of color. If you're looking for something to do with those extra beads, try this necklace DIY. It's one of my faves! So what do you think about this hat string? Are you ready to add one to your oversized sun hats? Or, do you have another hack that's even better? Let me know in the comments below!